You have brains in your head and feet in your shoes. We only need six minutes of news! You’ve got gear in the rear and slots in both shows. But WE’LL be the ones who decide where you go! There’s goo on the highway. And poo at the zoo. Stop by the station and grab a hair-do! Lex will be waiting. Rex will be too. Just don’t take Larry. That dude’s a muh-ROON! Now get off the horn and get here real soon. You’re late for a meeting! We need a new promo and a phoner at noon! The scanner just burped! It horkled and hacked! We’re gonna need you two to come back! Pick up a live truck! Head straight out of town! An unpleasant something has just fallen down! It jumped from its perch with a couple of jolts. We’ll get the sidebar. You do nuts and bolts! You can’t lag behind! But please do not speed! There’s no time for lunch! You’re now THE LEAD! Producers are juicing! A manager stammered! I’m pretty sure, our sports guy is hammered! But that’s not important! In times like these. Hey, make sure you feed back some kind of tease! We know you’re not there yet! And busy as hell. But we need to know just HOW this thing fell? Did it wiggle in space? And fall on its face? Did something else push it? Did it just take a dive? Was it feeling depressed? All out of jive? Let us know when you find out. We’ll do it LIVE! You’ll round off the bottom. In a box off the top! We’ll come back after weather. And probably not stop! We’re still in the book. So try not to flop! Now put down that phone and know you’re the best. And whatever you do, wear that damn vest! Tweet when you get there. We’ll flesh out the rest! "You shall know the truth, and the truth shall make you ODD." Ten minutes into a cocktail party and I'm reminding the wife how much I don't like people. Put a camera on my shoulder and I'll high-five my way through a leper colony. 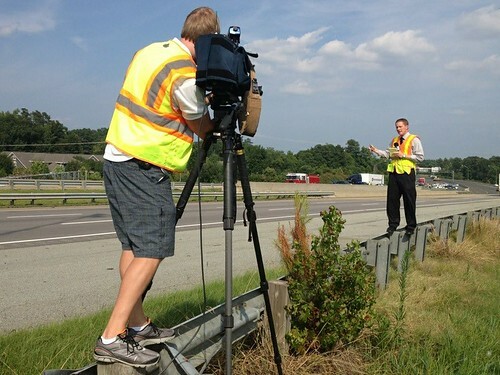 A friend of mine can field strip a twenty-thousand dollar videocamera, parallel-park a live truck covered in duct tape and slam together a minute thirty report during commercial breaks. Yet he still needs help filling out his time sheet every week. Loose women and fast cars don't do a lot for me, but break out a fat shaft of daylight or a conveyor belt full of mason jars and I grow visibly titillated. I've got buddies who can name every shade of gray visible in the average TV test pattern. But don't expect them to match their pants with their shirt. Life coaches, priests and financial advisors I got no use for. However, I keep a body language expert on speed-dial and a discount chiropractor on stand-by. I myself have hung out of homemade helicopters, nodded off during hurricanes and interviewed a murderer or two. What really scares me are dying Double-A batteries and nighttime assignment editors with my phone number on their lips. As far the above photo, It's only young Robert Hollins plowing through another workday, one in which provocatively dressed women paddle the rumps of color-coordinated pedestrians while a certain Emmy award winning journalist wishes for invisibility... Nothing odd about that. "When you're there and you're hearing these stories, you try to block them out but you can't 'cause at the end of the day, they start playing back in your head."